These individuals - described by the researchers as "supertaskers" - constitute only 2.5 percent of the population. They are so named for their ability to successfully do two things at once: in this case, talk on a cell phone while operating a driving simulator without noticeable impairment. This finding is important not because it shows people can drive well while on the phone - the study confirms that the vast majority cannot - but because it challenges current theories of multitasking. Further research may lead eventually to new understanding of regions of the brain that are responsible for supertaskers' extraordinary performance. "According to cognitive theory, these individuals ought not to exist," says Watson. "Yet, clearly they do, so we use the supertasker term as a convenient way to describe their exceptional multitasking ability. Given the number of individuals who routinely talk on the phone while driving, one would have hoped that there would be a greater percentage of supertaskers. And while we'd probably all like to think we are the exception to the rule, the odds are overwhelmingly against it. In fact, the odds of being a supertasker are about as good as your chances of flipping a coin and getting five heads in a row." 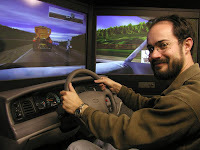 The researchers assessed the performance of 200 participants over a single task (simulated freeway driving), and again with a second demanding activity added (a cell phone conversation that involved memorizing words and solving math problems). Performance was then measured in four areas-braking reaction time, following distance, memory, and math execution. The results are in line with Strayer's prior studies showing that driving performance routinely declines under "dual-task conditions" - namely talking on a cell phone while driving - and is comparable to the impairment seen in drunken drivers. "There is clearly something special about the supertaskers," says Strayer. "Why can they do something that most of us cannot? Psychologists may need to rethink what they know about multitasking in light of this new evidence. We may learn from these very rare individuals that the multitasking regions of the brain are different and that there may be a genetic basis for this difference. That is very exciting. Stay tuned." The current value society puts on multitasking is relatively new, note the authors. As technology expands throughout our environment and daily lives, it may be that everyone - perhaps even supertaskers - eventually will reach the limits of their ability to divide attention across several tasks. "As technology spreads, it will be very useful to better understand the brain's processing capabilities, and perhaps to isolate potential markers that predict extraordinary ability, especially for high-performance professions," Watson concludes.